The first contribution to our Dear Mr. President project is from fellow witness - blogger and activist Matthew Saberhagen, entitled "Dear Mr. 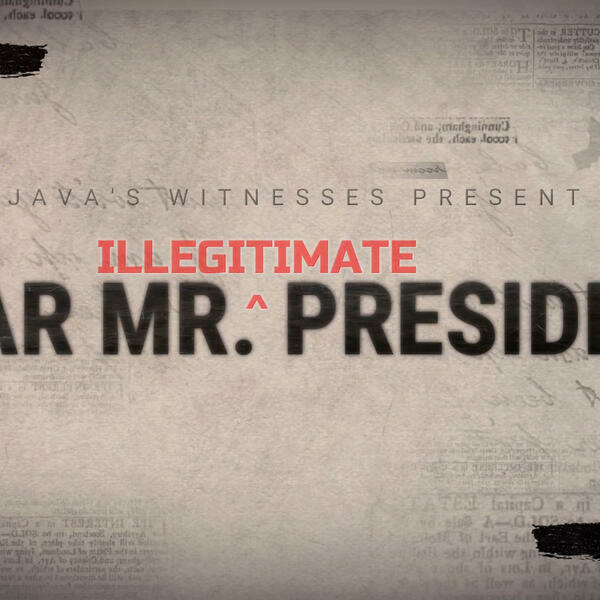 Illegitimate President". Our "Dear Mr. President" project aims to amplify your concerns to the world by reading or airing your concerns on our podcast. Some will even be produced into videos like the one you're watching right here. In addition to being posted on YouTube, they will also be posted on our show's web site and Twitter page and occasionally directly to our show feed. We want to give a higher platform to more every day people just like you. Whether you're satisfied or dissatisfied with with way our current President and his administration are handling things - we'd love to hear your thoughts. Audio submissions can also be submitted to the site as well. We ask that they are no longer than 5 minutes in length, contain no copyrighted works, and have as clear of vocals as you can manage. Links to audio are recommended, but not required. Created by long-time friends and avid coffee drinkers, Eliza Groski and Olivia Kingston, The Java’s Witnesses Podcast was established in 2018 to give a platform to real everyday voices and opinions in today’s world. Now you might be wondering – “Why the name? Why Java’s Witnesses?” You know that first sip of coffee on a sleepy, hungover morning? Its almost a religious experience. Coffee is often so integral to our everyday lives; first dates are often over coffee, big life-changing conversations, even interventions – all over coffee. Its the one thing most people can’t adequately start their day without. But most importantly – its comforting and warm – but also bitter, like the truth. Those are ideals that we like to embody. To be comforting, warm and accepting to all – but to also be completely truthful, and perhaps even occasionally bitter with some of our opinions. Often the opinions of real everyday people are lost in the rhetoric that’s spewed on cable news and online, so before we talk about any story or issue it is thoroughly researched from multiple outlets. We take this media bias chart into consideration with all sources, and ensure to use multiple across the spectrum – as that is also where our views lay. The Java’s Witnesses Podcast is primarily recorded via Discord, due to location differences. We do hope to have special in studio episodes in the future.